To start with I should first tell you that I had these long thick silky hairs which is a dream of many. Getting a compliments like 'your hairs are awesome', 'you have hairs in abundace, you don't need anything to cover your shoulders', and people asking tips like 'how do you manage your hairs?' 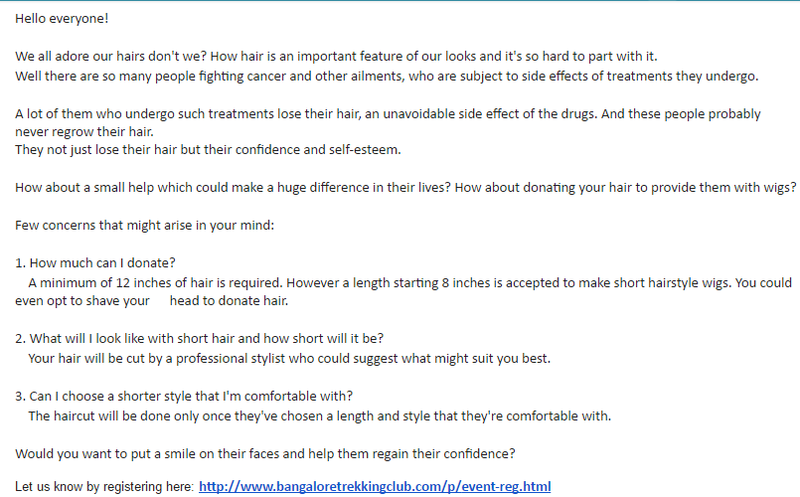 ' how come so thick n long hairs being in bangalore?' 'I guess whatever you eat goes in your hairs' were so common for me and I loved my hairs too. I touched my hairs and was imagining a cancer patient leading a normal life flaunting these hairs. The very idea of giving something that I have in abundance and still loosing nothing was really great and then a doubt started getting in my mind, what if it's not really a donation? What if they sell it? How should I believe them when I have absolutely no idea about them? I would do it in a good spirit, but what if people make money out of it? So many questions.. I mailed Monisha that I am interested and also bombarded with lot of questions. She answered patiently to everything, still I was not convinced. 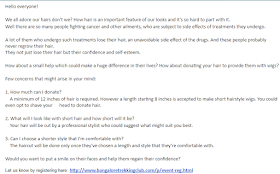 It was then she gave me the link which made me believe and take firm decision of donating hairs. As usual, there was resistance from friends, family etc. Those who saw above video did not refuse again and others just understood that my decision is not gonna change. My mother said 'donate some money na? Why do you want to ruin your beauty for donation?'. I simply said 'If shortening hairs hurts beauty, think of those who don't have hairs, what they might be feeling?' Finally, all set and done, I went to saloon and got my hair 12 inches for donation and then got a beautiful hairdo. The change in my looks due to haircut, the compliments for new look, I thoroughly enjoyed it all. 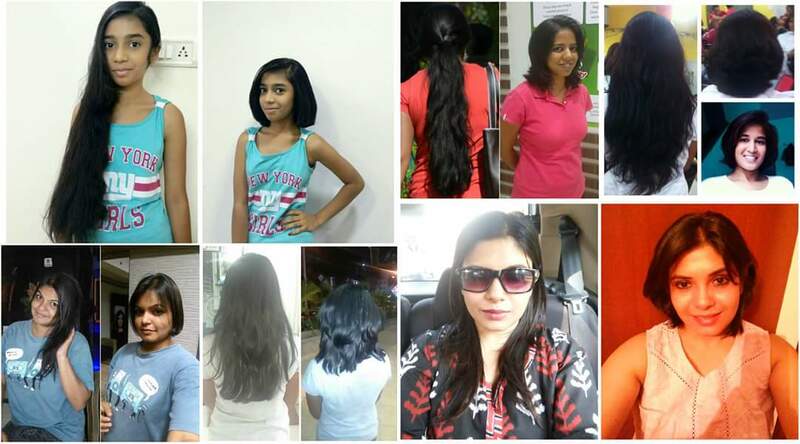 Organizers asked for photos from all donors before and after haircut, so good to see so many people doing it! On Saturday Monisha called all of us to meet the person (Marishetty Kumar) and donate hairs directly to him. Every lady came for donation had same struggle to go through while cutting hairs for donation. It really takes lot of determination to struggle and do the right thing :) . Cheers to all the lovely ladies.. There at Marishetty Kumar's small shop,seeing his hardwork, the delicacy involved in the work, his experiences, down to earth nature, all was really inspiring. His fully red eyes were proof of his involvement and struggle both. He said "It takes 1 week to make one wig" He washes the hairs he gets, sterilizes those, then makes a bunch of every 5 strands of hairs before actually weaving them into the wig. Nearly 4 inches of hairs go inside the wig, hence 8 inches of hairs would make small wig and 12 or higher for a long wig. It requires 3-4 people's hairs for one wig. He gets orders from all over India, he takes measurement or people send it by WhatsApp and then makes wig accordingly for them. He usually buys hairs from Tirupati temple, with 1 kg prize going in thousands. It is so disheartening that people donate hairs to God and then temple authorities making money out of it. He said "I get hair donations from abroad as well, people courier the hairs." And we give hairs to God for people to make a business of it. After donating my hairs, one lady in office was telling me 'you should donate hairs only to God and no one else.' These people should come and see this after effects of hair donation to God. Hi ma'am, I too was planning on donating my hair, but how exactly should I go about it? If you could guide me through the process, it would be great.